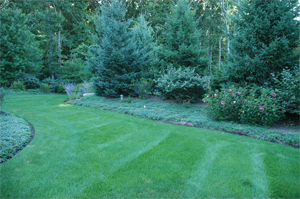 Spring is just around the corner, so it's a great time to think about securing lawn service for the season. It's wise to take care of this before your grass begins growing. That way, your service provider will be able to get a handle on your particular lawn from the very start. If you've been on the fence about hiring a lawn care service in the past, give it a try this season. Your lawn's health will get a big boost, and you'll find that you have the time to enjoy other pursuits. 1. Sign up early. Lawn care companies offer spring discounts to get their schedules filled up for the season. Be one of the early birds, and you can often take advantage of discounts that last all summer long. 2. Prepay. When customers prepay for lawn care services, the providers don't have to deal with billing and accounting, saving them time later in the summer when they really get busy. Because it's easier for them to work with prepaid accounts, many lawn care services offer a discount to customers who prepay at the beginning of the season. Prepaying makes your own accounting easier as well. Pay once and forget about it the rest of the season. 3. Refer Your Friends. Take advantage of additional savings by participating in a lawn care service's customer referral program. You may get discounts or even cash back on your services simply by telling your friends and neighbors about the great service you're getting. It's a win-win situation. Your friends also get great quality lawn care, and you get a discount on your own. 4. Fill Out Surveys and Offer Testimonials. Some companies offer discounts or other incentives to customers who provide valuable feedback. This feedback may come in the form of a survey or a testimonial for their website or print literature. Either way, you can benefit financially from providing feedback. Will I get the same technician each time? Will the technician diagnose and treat lawn problems? If a problem arises, is the treatment included in the plan? Does service include aeration and fertilizing? Do you service your equipment on a regular basis? Will my lawn care service be customized for my property? Do technicians present themselves in a professional manner? Will the technician be proactive in taking care of potential problems? By following these tips, you can get the best lawn service prices for your home, knowing full well that you'll also be getting the best available service. Your lawn will thrive, your home will look neat and tidy, and you'll have the freedom to spend your summer enjoying the beautiful weather with family and friends.